I finally got a nice evening to fly the PT-19 tonight. Took it out about 8:30 PM (sunset at 9:07 this time of year). Very light west wind. 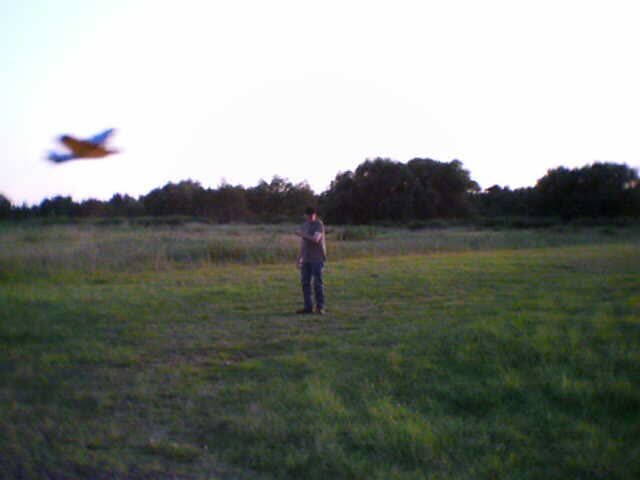 I got three nice flights in, and didn't break the airplane. Didn't get any video, but here are a couple of pics of what a PT-19 should look like after a few flights. Yep looks like a veteran! My first flight was over 35yrs ago with the PT would be cool to put stunt flaps on one with a TD. The foam wheels you have must help on softer landings if over pavement / or hard packed dirt. Best wishes and may you have many flights ahead! Well, all-righty then! Nice job and flights! I do want to see a TD powered PT-19....anybody have a motor mount adapter?? 1/2A Nut wrote: Well done TLAnderson! It's pushing 47 years ago that I had my first PT-19. 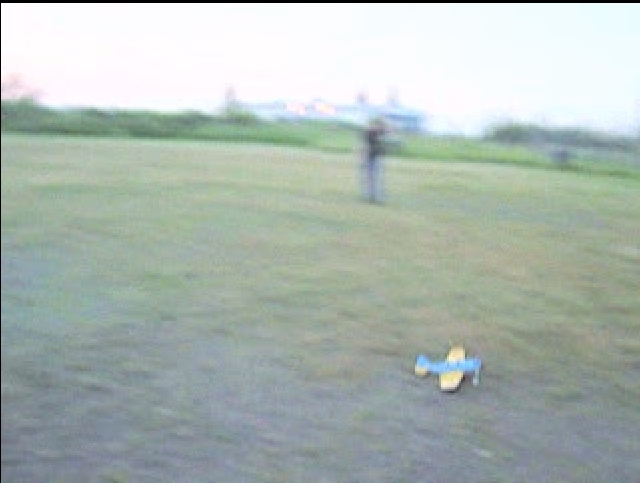 The wheels do seem to help on takeoff on a rough field. With no breeze, the plane drops in pretty hard when the engine quits. Usually bends the landing gear a little. Got three more flights in tonight. The wind let up right before sundown, so, I had to try it. Here are some crappy captures from a crappy video. Must get a better camera! Way to go TL ! Hot as crap here and the afternoon thunder boomers with down pours but, am sure there will be some time to get in the air for too much longer ? Always good to see a Cox PT-19 in the air. Congrats TL! Almost all Cox planes can be flown solo as they have a built in self launching mechanism which is part of the rear of the bell crank. All you need is a 16 penny nail and 2 feet of Dacron line. Tie the line to the nail and make a one inch loop in the other end of the line. Drive the nail into the ground, give the PT-19 full up, slip the loop of line into the notch on the rear end of the bell crank. Start engine, be sure loop of line is on the bell crank, go grab the handle and give it momentary full down to release, just that simple. Cox thought of it all guys! jmendoza wrote: Almost all Cox planes can be flown solo as they have a built in self launching mechanism which is part of the rear of the bell crank. All you need is a 16 penny nail and 2 feet of Dacron line. Tie the line to the nail and make a one inch loop in the other end of the line. Drive the nail into the ground, give the PT-19 full up, slip the loop of line into the notch on the rear end of the bell crank. Start engine, be sure loop of line is on the bell crank, go grab the handle and give it momentary full down to release, just that simple. Mr. Mendoza. Thanks for replying. As a kid in the late '60s, I spent a lot of time messing around with my PT19, Spitfire, and Buick Riviera. Thanks for being a part of making those products available. I looked at using the bell crank hook, but just didn't trust it to hold the plane back until I could get to the handle. 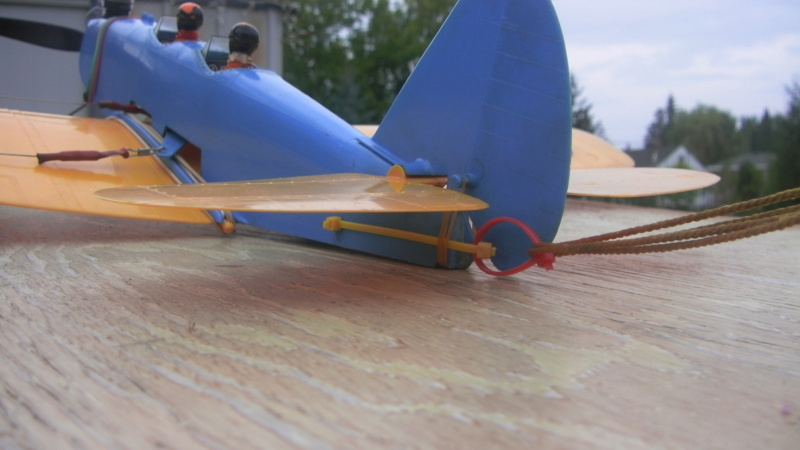 The stooge I made, cost nothing but a little time, and a couple of bucks for hardware, and it is almost fail safe (as long as I remember to hook the plane to it before starting the engine ). I'm hoping the wind will drop today, so I can fly the PT19. I put some 35' Spectra lines on it, and want to try them out. You know, the other day I forgot my nail with the string, but had two small screwdrivers with me that I stuck into the grass, one in front of the right wing close to the fuselage, and the other in front of the stab, also close to the fuselage. After starting, I just had to pull on the handle to get the PT-19 to slide sideways and clear of the screwdrivers and I was flying. My pal who had gone to his car for another plane could not figure out how I had launched the plane by myself when he heard it and saw it in the air. I wonder if the wire on your tail has moved the CG aft and help make your PT-19 more aerobatic, as they are kind of nose heavy. My plan is to get my other identical "You Fly" PT-19 set up with lines so we can do some slow combat using ten foot crepe paper streamers. I have a third one, new in the box, for a total of three of the China versions, and 3 other of the real old ones with Baby Bees, but they are probably too brittle to fly and I would hate to cloud up the clear windscreens as the fuel really screws them up. 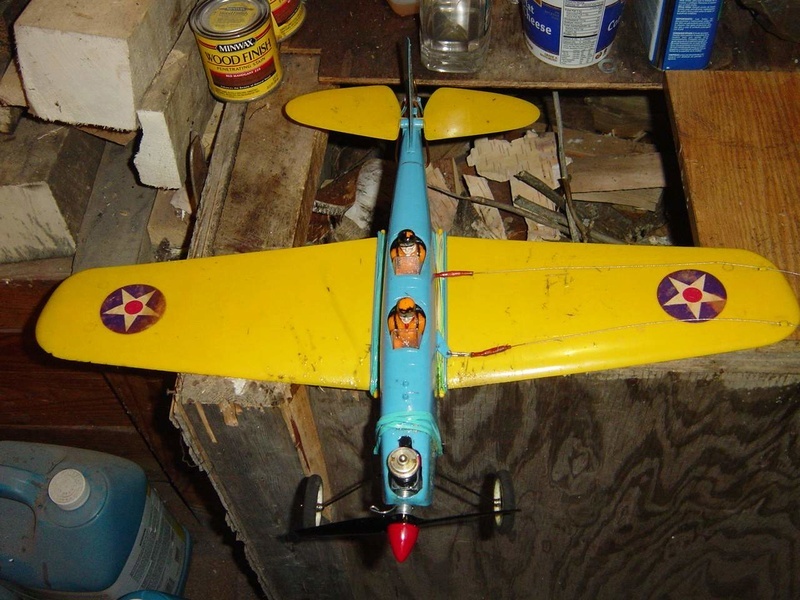 The funny thing is that as a kid, I never owned a PT-19, but had probably two of the worst flying Cox planes, the black Stuka, and the red Piper Super Cub. 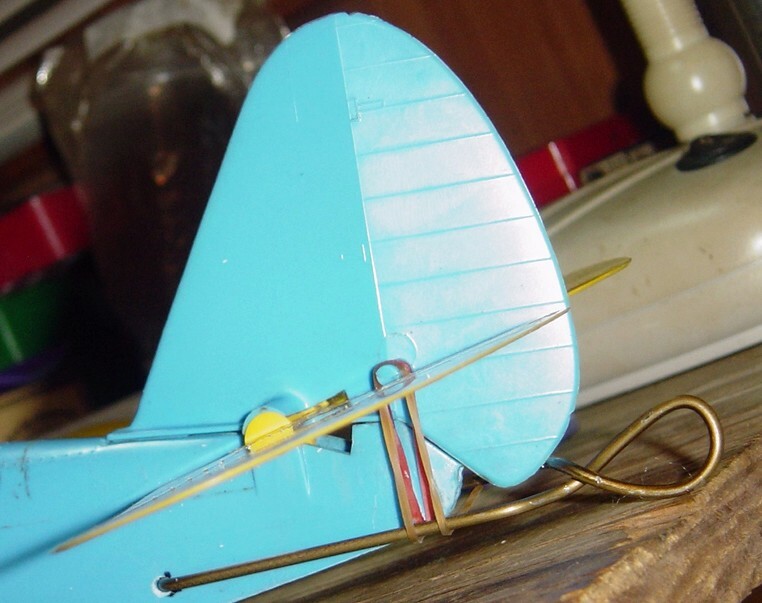 The P-40 with the upright Baby Bee was one of the better flying all plastic Cox scale type planes. Got a couple of flights in tonight. Beautiful evening. I made up a set of 35' Spider wire lines a while back. They work great. Your shaming me TL. Soon after I get over this motorcycle, MG restoration phase I promise I will get back into circular motion. Good Deal TL , Looking GOOD out there !! It was has how we kids in the school yard, after school, sort of taught ourselves about combat. Remind me again when is the CEF annual "Fly it if you got it" PT-19 day/week for 2017? TLAnderson wrote: Got a couple of flights in tonight. Beautiful evening. I made up a set of 35' Spider wire lines a while back. They work great. I like the take-off photo-sequence! Looks like a fairly remote flying area you have there. I'd like an area such as that to fly at. There's one spot that's not too far from me; a dead-end street terminating into a 80-90 foot diameter paved-circle. Where it's been YEARS since I've flown; I'm a little nervous with flying over asphalt. So.. you liked the SpiderWire line.. Cool! I now have both; 15# and 30# SpiderWire line. What did you use? I have a two-line/42' set (4 line-connectors) that I made from the 30# line. It was regulation-length for our CEF Speed-Contest in 2014. My airplane-entry never got off the ground though. Your PT looks like it's flying tail-heavy. That's a fairly heavy wire you have there for the stooge-link.. I would personally remove that wire.. and replace it with a piece of Mason's-line (string) with a loop tied in the end for your stooge-pin to engage. 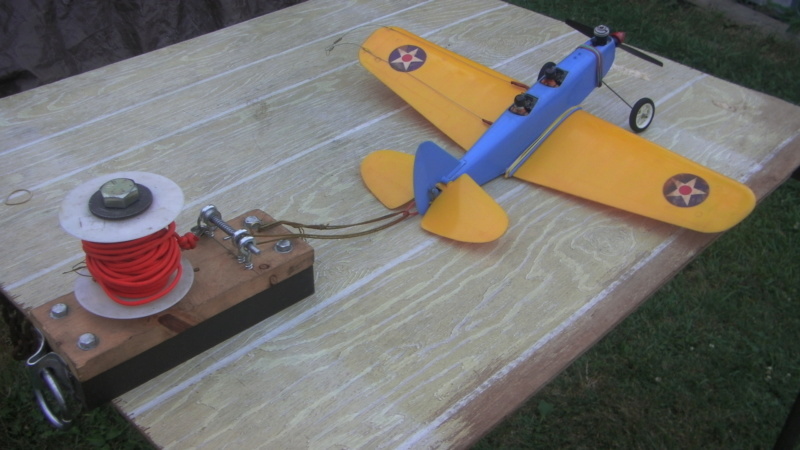 I see that your wire is "held up" via the tail-feathers rubber-band mount-system with the loop for the stooge arranged to contact the bottom of the rudder. That was good thinking to avoid interference with the stabilator. A piece of string tied to the existing hole for your wire shouldn't cause any control-issues.. and would be a lot less weight in the tail. 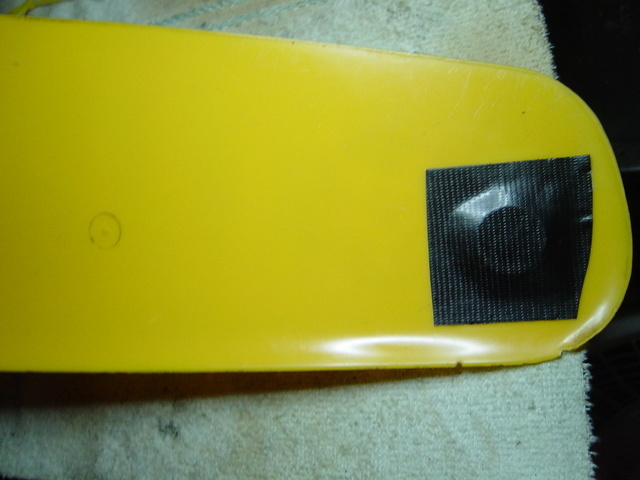 My PT is a later version which has a tab-type tailskid through-which I drilled a hole for my stooge-pin. 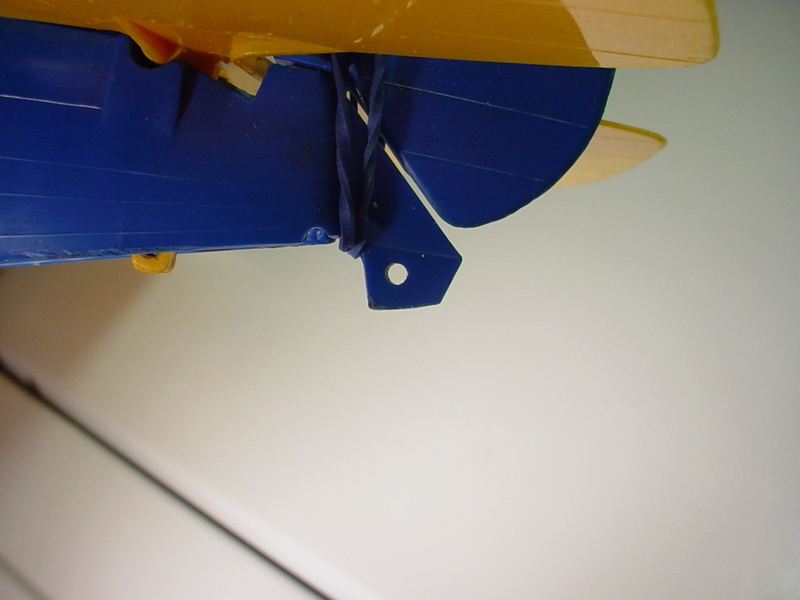 On my model; this tailskid serves as an integral-mount for the rubber-bands that secure the model's tail-feathers. Your model's fuse is differently-molded at the tail.. but looks to be notched for looping the rubber-bands around. If the notch is worn-flat for some reason.. you could use a rasp/file to cut the notch deeper to retain the rubber-bands. 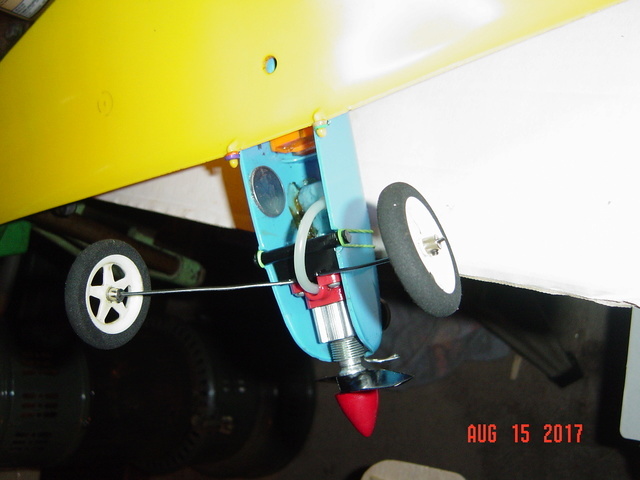 If you opt to replace your solid-wire stooge-link with string.. you may want to adjust engine-thrust back to the "beginner" (down-thrust) setting for the first flights until you get used to the balance-change which may be significant. The stock propeller for the PT19 was a "left-hand" 6 x 2 and thus; the model was fitted with a L/H starter-spring. I see that you've had both L/H and R/H props on the engine. Sorry if I've mentioned this before.. but the L/H prop's reverse-rotation "torque-rolls" the model "away" from center-circle.. rather than "in" towards it.. assisting with line-tension. My PT19 has no outboard wingtip-weight because of this.. and yours probably doesn't either. If you continue to fly the model with a "R/H" propeller; that's ok.. but you will find that providing some outboard wingtip-weight will "level-out" the opposing wingtips for a better-flying airplane. Try taping a "penny or nickel coin" under the wingtip on your next flight that uses a R/H propeller.. and see if you can observe any difference. 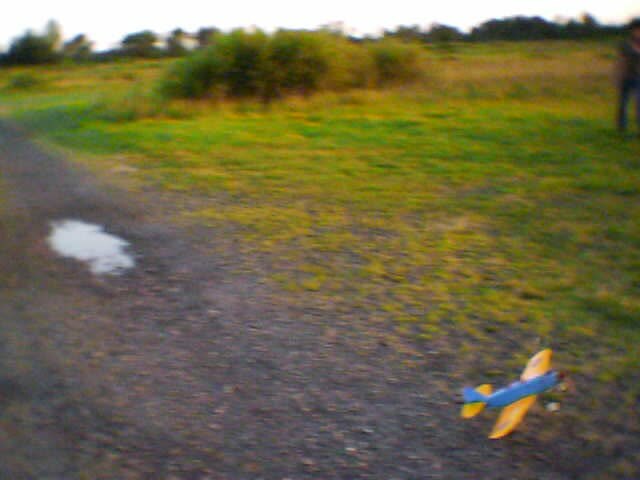 The stock 6 x 2 L/H prop's 2" pitch.. 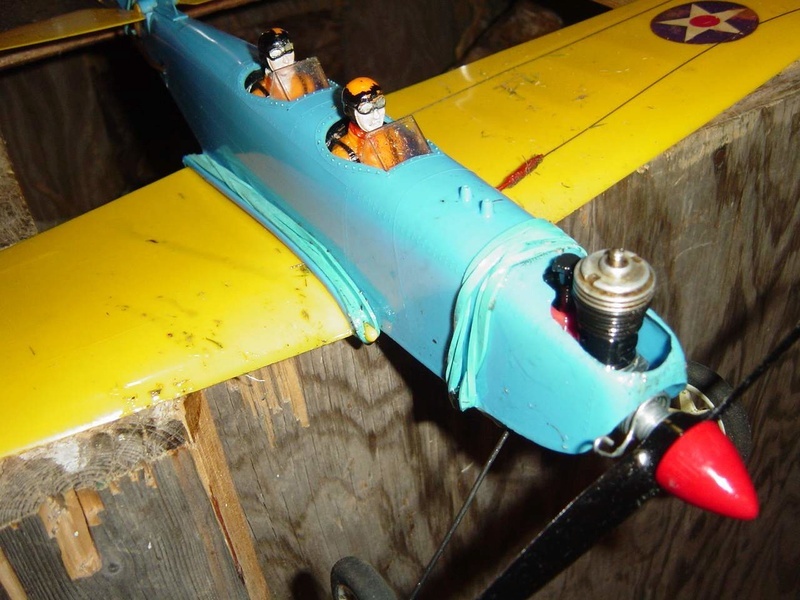 I feel helps keep the reed-valve engine up high in its power-band for running a 6" diameter prop. Running a 6 x 3 propeller on a heavy model such as this, will tend to "lug-down" the engine. A 5 x 3 propeller on the PT19 should be fine.. regardless of it's rotation.. just remember to add some tip-weight when running a R/H prop. I hope that this info helps you to get many more fun flights out of your model! Don't forget about the CEF PT19 fly-a-thon! I like the take-off photo-sequence! Thanks. My wife was running the video camera and got a nice takeoff shot. 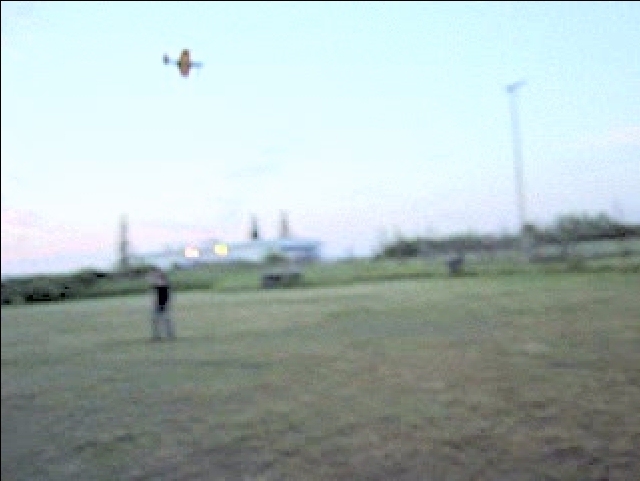 The photos are captures from the video. Looks like a fairly remote flying area you have there. It's actually right in town. It's the parking lot for the county fair grounds. It's unused most of the year except when the fair is on. I'm a little nervous with flying over asphalt. Me too. Very unforgiving of hard landings. 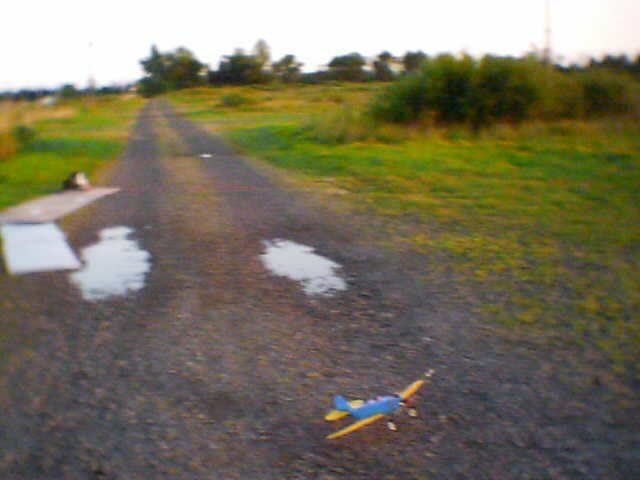 I broke the tail skid off the PT landing on asphalt. So.. you liked the SpiderWire line.. Cool! I now have both; 15# and 30# SpiderWire line. What did you use? I used 15# test line, and 20# test fishing line connectors. I have a two-line/42' set (4 line-connectors) that I made from the 30# line. 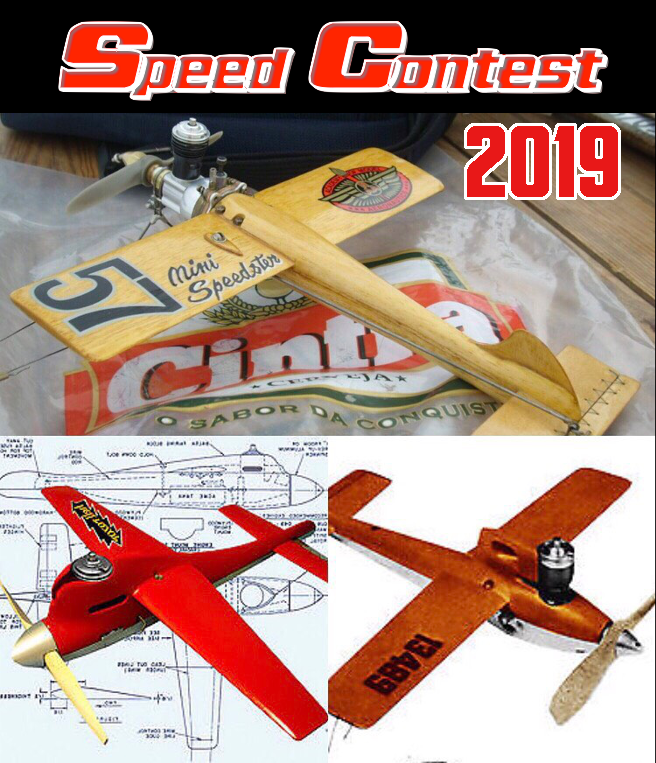 It was regulation-length for our CEF Speed-Contest in 2014. My airplane-entry never got off the ground though. The wire performs two functions. It's a tailskid and a stooge connection point. It may be heavier than it should be, but that's what I had to work with. To counteract the weight of the wire, I did another mod which may or may not have been a good idea. The plane flies ok, but it's not going to do any stunts. Mine had a tailskid, but it got broken off in a hard landing. I tried gluing it back on, but it didn't hold. Hence the wire skid. I did file the notch deeper to try to retain the bands. The stock propeller for the PT19 was a "left-hand" 6 x 2 and thus; the model was fitted with a L/H starter-spring. I see that you've had both L/H and R/H props on the engine. My PT came to me with a 6x2 left handed prop, which got broken when it hit a rock on takeoff. Those props seem to be made of unobtainium, so I've been using 6x3.5 RH props. If I could find a source of the LH props, I'd go back to using them. Sorry if I've mentioned this before.. but the L/H prop's reverse-rotation "torque-rolls" the model "away" from center-circle.. rather than "in" towards it.. assisting with line-tension. My PT19 has no outboard wingtip-weight because of this.. and yours probably doesn't either. If you continue to fly the model with a "R/H" propeller; that's ok.. but you will find that providing some outboard wingtip-weight will "level-out" the opposing wingtips for a better-flying airplane. Try taping a "penny or nickel coin" under the wingtip on your next flight that uses a R/H propeller.. and see if you can observe any difference. I have a nickel tip weight on it. It really helps. 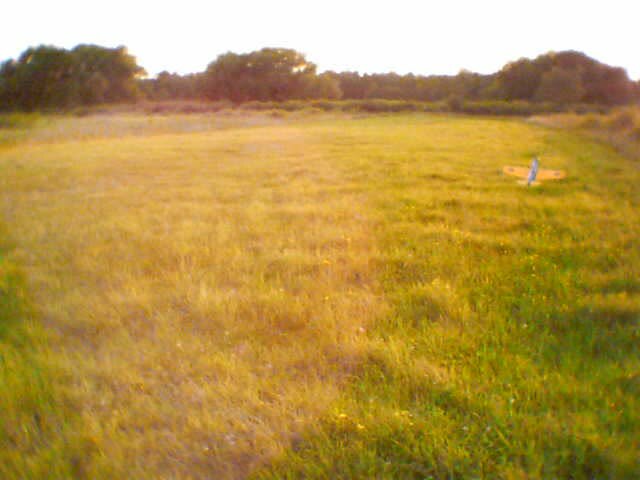 The stock 6 x 2 L/H prop's 2" pitch.. I feel helps keep the reed-valve engine up high in its power-band for running a 6" diameter prop. Running a 6 x 3 propeller on a heavy model such as this, will tend to "lug-down" the engine. A 5 x 3 propeller on the PT19 should be fine.. regardless of it's rotation.. just remember to add some tip-weight when running a R/H prop. Lots of helpful info here, Roddie. Thank you. When is the fly-a-thon? Hi TL, You're welcome.. but it looks like you had all of your bases covered beforehand! I don't know when the fly-a-thon is. It doesn't look as though a date's been set yet..
See the below CEF link.. It's been previously held in September.. so it could be soon. 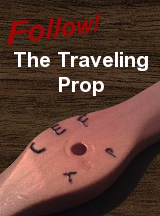 Cox International currently stocks two L/H props.. a 2-blade 4.5 x 4 (@$2.95/ea.) and a 3-blade 5 x 3.5 (@$2.49/ea.). 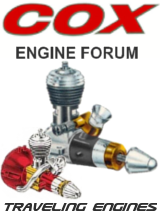 Running either of these on your PT-19 will provide increased ground-clearance over the 6 x 3.5 that your using now.. as well as being less load on your engine. Props in the 5 x 3 range regardless of rotation, will run very well on the Cox .049 reed-valve engine in the PT. I would personally choose the cheaper 5 x 3.5. $10 will buy four of them +shipping. Maybe "bundle" with a spare glow-head and some engine-rebuild parts.. (gaskets, screws reeds..) Do you still have the L/H starter spring? Cox International stocks the OEM "zero-drag" L/H part. Not much you can do about "prop-strikes" due to stones on the runway.. but there "is" a measure you can take when mounting a "2-blade" propeller on your engine. 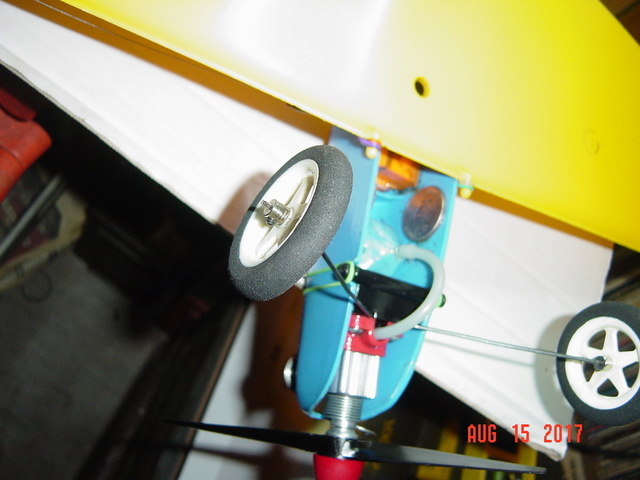 When installing the prop; turn the engines' "prop-drive plate" in the rotation of the prop (right or left-hand, whichever applies) until you feel the piston compressing in the cylinder. 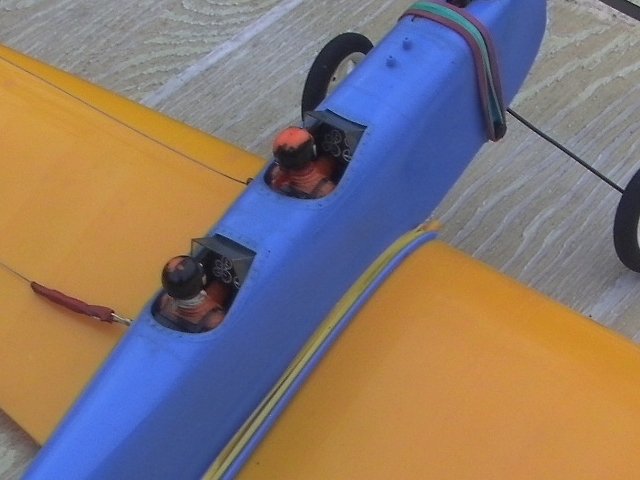 Tighten the prop "horizontally" in this position (parallel with the models' wing). When the engine runs out of fuel at the end of a flight.. the prop will usually "windmill" until it reaches this horizontal position.. rather than at a position near vertical where it could strike the ground when landing. I lucked-out with Cox L/H 6 x 2's when I scored two 2-packs from an old hobby-shop that went out of business a few years ago. You "can" find them.. although they're not necessary. Cox probably chose the 6 x 2 L/H prop for two reasons; left-hand primarily for increased line-tension to help the beginner-pilot.. and possibly as a "cosmetic" feature. The 5" diameter props "look small" on the model. The PT-19 has been kind of neglected lately as I've been working the bugs out of the Skyray. I got it out tonight, and cleaned it up a little, trying to get ready for "Fly it if you got it" day. I took Roddie's advice and got rid of the wire tail skid/stooge link. I made a replacement up from 4 zip ties. Should be a little lighter. The pilots helmets were looking a little worn, so I darkened them up with a permanent marker. I also put a right handed starter spring on it since left handed props are kind of scarce. Hopefully, it's ready to go, and we'll have some decent weather for "Fly it if you got it" day. Looking REAL GOOD there man! I'm hoping to fly my model too.. How many years have I said that?? I have done some work to mine though.. It needed a "fuel-tank fix".. and I think that I've found one in a Sullivan #435 1 oz. RC "clunk-tank". 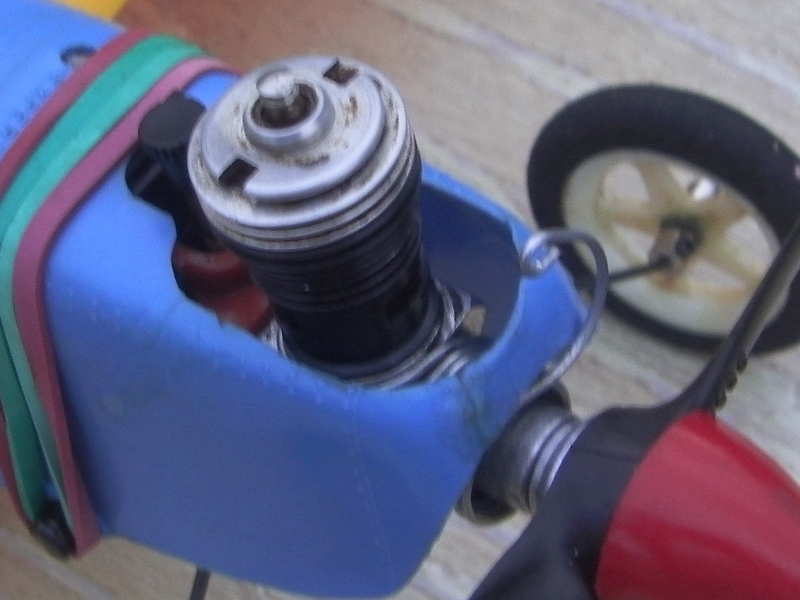 It fits perfectly inside the fuse if the stock plastic fuel-bowl is removed. It will also slide-back directly over the CG. 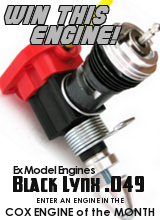 A HOT ENGINE would have a whole ounce of fuel to burn, without adversely affecting the models' balance. Great to see you guys having fun with the venerable PT-19, I flew mine several times this year. 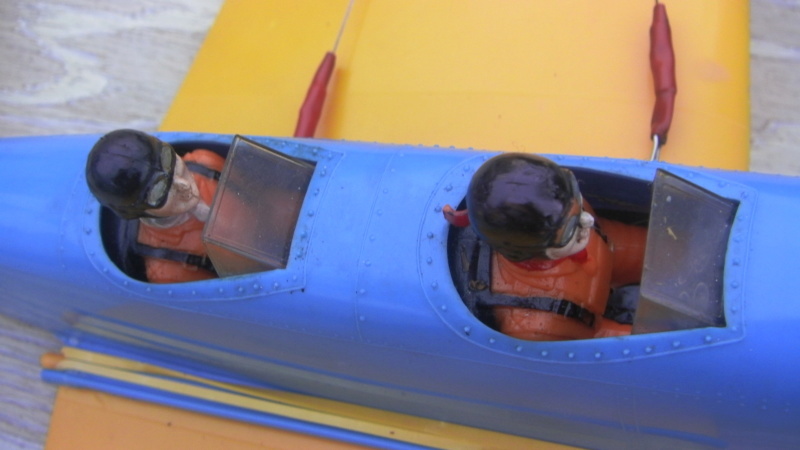 I actually used it to train three prospective R/C pilots and had them fly the PT-19 first. Once they were able to take off , fly and land several times, it got them to the point where they had some feel for flying. Pitch control is very important to master in R/C, and the PT-19 does a great job of training one's skills on the use of the elevator. 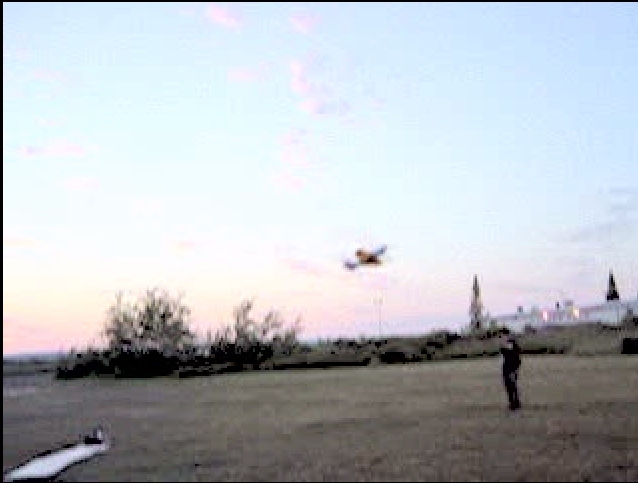 I recommend every prospective R/C flyer should fly a good control line trainer before trying to fly R/C...it really helps. 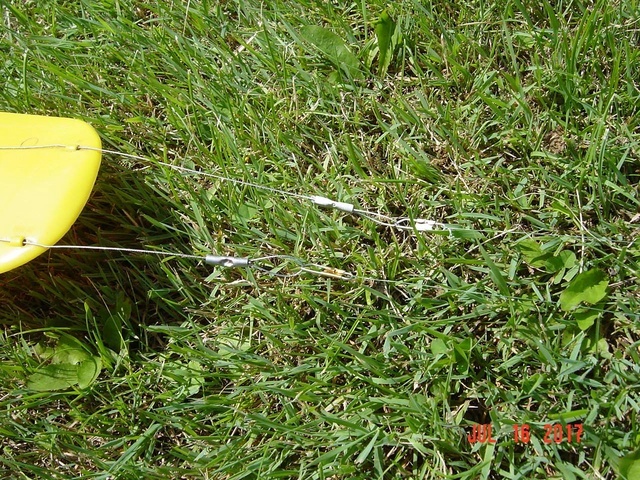 What I have found is many people tried to fly the Cox ready-to crash-plastic-trash controline planes and tell the usual story: "It went straight up, then straight down and smashed to bits when it hit, that was it for me and model plane flying!" So it really helps give confidence to these people to have success with a control line plane and restores their confidence in their ability to learn to fly.